We offer installation, replacement, and repair of heating & cooling products in Huntersville, NC, so you can make an informed decision about what would be best for your home, family, and budget. 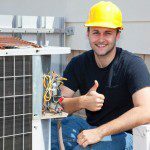 While there are some indications that your heating & cooling products are not operating correctly and efficiently, some are less noticeable. For example, if your system is working harder than it needs to, suddenly you will likely notice that your utility bill has jumped significantly. On the other hand, if something gradual is going on, you may not realize that extra $5 or $10 is a sign that something is wrong. The same is true for how comfortable you and your family feel. Your body can adjust to small changes without realizing that your home is not as comfortable as it once was. If you would like to know if your heating & cooling products are working correctly and efficiently, we encourage you to give us a call at Cool Comfort Heating & Air. Trained technicians from our location in Huntersville, NC can come inspect your heating & cooling products. We offer installation, replacement, and repair of heating & cooling products, so you can make an informed decision about what would be best for your home, family, and budget. We offer a variety of services including indoor air quality and air flow analysis, preventative maintenance agreements, replacement thermostats and the replacement of aged inefficient heating& cooling products. We offer quality products at a fair price and can help you with financing if needed. We have been providing quality service for over 15 years and look forward to tackling your needs. We respond quickly and make sure our trucks are well stocked to ensure timely repairs and installations, whether that is during the day, at night or even the weekend. Give us a call today and see how a locally owned and operated heating & cooling products business can make a difference! At Cool Comfort Heating & Air in Huntersville, NC, we carry a wide variety of thermostats, includingvarious types offered by Honeywell. We often recommend Mitsubishi Mini-Splits to our clients in Huntersville, NC because they are an energy efficient, flexible home comfort solution.